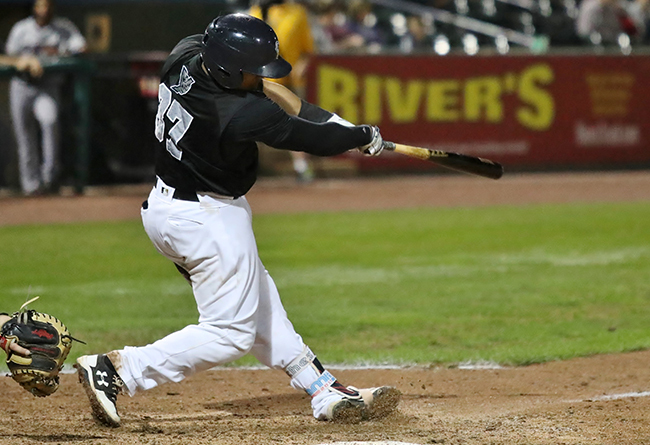 (York, Pa., Feb. 19, 2019) - The York Revolution announced three more player signings for the 2019 season, bringing back catcher/first baseman Isaias Tejeda and left-handed relief pitcher Dustin Richardson, while adding outfielder/second baseman J.P. Sportman. The additions were unveiled by manager Mark Mason live on “Revs Hot Stove Weekly” presented by Shipley Energy on SportsRadio 1350 WOYK. Tejeda returns for his fourth season with the Revs. A prospect in the New York Yankees organization over his first six professional seasons, the Dominican Republic native first came to York at the start of the 2016 season, during which he batted .356 with nine home runs in 65 games over two stints with the club, as his contract was purchased by the Atlanta Braves that June. Among his highlights was a 28-game hitting streak that spanned both stints, the second longest in Revs history. The 27-year-old spent the entire 2017 championship season in York, batting .300 with 17 home runs and 78 RBI. After a stint in the Mexican League to begin the 2018 campaign, Tejeda returned to York, where he batted .303 and drove in 22 runs in 22 games last year. Tejeda enters the 2019 season with a .318 career average during his time in York, tied for seventh highest in franchise history. He has belted 28 home runs and knocked in 138 runs in 208 games, and he ranks 10th in club history with 62 doubles and tied for seventh with a .502 slugging percentage. Richardson joined the Revs in August of last season and dominated in 13 outings, allowing just five runs in 15.2 innings for a 2.87 ERA while walking four, striking out 27, and notching four saves. The 6-foot-6 lefty previously pitched in the Atlantic League with Sugar Land and Long Island over parts of five seasons and enters his 14th pro season in 2019. The Newton, KS, native was originally a fifth round draft pick of the Boston Red Sox out of Texas Tech University in 2006 and reached the Major Leagues for a combined 29 appearances in 2009-10, compiling a 3.31 ERA at the big league level. The 35-year-old has also pitched at the Triple-A level with the Marlins, Braves, Angels, and Dodgers. Sportman comes to York having spent his entire five-year career in the Oakland Athletics organization, reaching Triple-A Nashville last season. The 27-year-old has spent the bulk of the past three years with Double-A Midland, batting a combined .273 with 14 or more steals and 27 or more doubles each year. He has also hit a dozen or more home runs each of the last two seasons. A native of Schenectady, NY, Sportman was a 27th round draft pick of the A’s out of Central Connecticut State University in 2014 and is a career .279 hitter with 37 home runs, 104 doubles, 16 triples, 245 RBI, and 69 steals. The Revs now have nine players under contract for the 2019 season and will continue to unveil signings each week live on “Revs Hot Stove Weekly” presented by Shipley Energy on SportsRadio 1350 WOYK. The next episode will air either Monday, February 25, or Tuesday, February 26, depending on WOYK’s local basketball playoff schedule. Check woyk1350.com for updated schedule information.